THE TREADLE OF THE LOOM: Massachusetts' First Gay Marriage? By chapter 3 of the book, Ishamel meets Queequeg in the Spouter Inn. 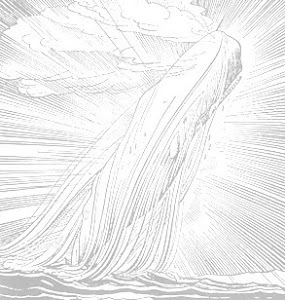 Melville starts really laying it on by this chapter; Ishmael enters the Spouter as if it is the belly of the whale or, alternatively, the bowels of a whaling ship. The bar is a "rude attempt at a whale's head"; there is a "heathenish array of monstrous clubs and spears". Ishmael painstakingly "reads" a besmoked painting, dimly and with difficulty through its layers of soot and grime finding a painting of a whale impaling itself on the three broken masts of a Pacific whaler. There are references to shades, shadows and the "stream of Time". The language is beautiful, flowing, and rich. We can feel this journey starting to take off, and sense an adventure in the air, and, once again, Melville is foreshadowing like there's no tomorrow. It is, as we shall learn, just before Christmas, and there is no room at the Inn, but, after first experimenting (rather comically) with a rude board of a bed in the bar, the Inn-keeper sends him off to bed with a man with a fine harpoon and a useful smoking tomahawk, not informing him, of course, that this fellow is a man-eater, a cannibal. ...this wild cannibal, tomahawk between his teeth, sprang into bed with me. I sang out, I could not help it now; and giving a sudden grunt of astonishment he began feeling me.... "Who-e debel you? ... you no speak-e, dam-me, I kill-e." And so saying, the lighted tomahawk began flourishing about me in the dark. "Landlord, for God's sake, Peter Coffin!" shouted I. So the madcap scene features a near-naked cannibal swinging a lit tomahawk pipe in the night talking in broken English while a half-clad green-horn hysterically screems for help. This is madcap stuff, worthy of the Marx Brothers, but very heavily charged with racial and sexual tensions. Nonetheless, by night two, they are a happy domestic couple, smoking together in bed, sharing their funds between them, and, as Queequeg says, becoming "married". The room, meanwhile, is a collection of phallic symbols capable of making a Freudian swoon. What to make of all of this? While this may be a clean and sparkling narrative, we're being told a story full of naughty insinuations and tweaks at accepted moralities. Is the overwhelming gay-ness of the whole relationship acceptable in its time only because of its comic element and its intercultural element; the misunderstandings must be other than what they most seem, because what they most seem wouldn't be acceptable? At the same time, the relationship between Queequeg and Ishmael is far from accidental. After a respite from the comic early bonding between Queequeg and Ishmael while Ishmael goes to church, we get to Chapter 10, "A Bosom Friend", and the following chapters, where the relationship deepens and is sanctified. Setting aside the cultural differences, Queequeg is a person who took the same voyage from home that Ishmael is now taking, for similar (not identical) reasons. He, like Ishmael, is alone in New Bedford, and, just as Ishmael goes to find his place of worship, Queequeg seeks out his. These two are anti-podes of the same person, and the fundamental sympathy of the two figures for each other is built on deeper ties than the superficial differences. ...[T]here is no place like a bed for confidential disclosures between friends. Man and wife, they say, there open the very bottom of their souls to each other; and some old couples often lie and chat over old times till nearly morning. Thus, then, in our hearts' honeymoon, lay I and Queequeg -- a cozy, loving pair. There is plenty of symbolism, imagery, references, and meanings lurking about these chapters; but there is something else, too, that is central to the novel's dramatic progress: a romance.